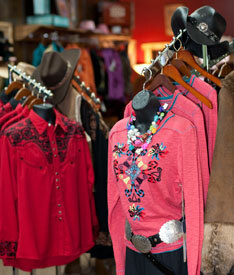 Downtown Grapevine certainly doesn’t lack for any rhinestone-studded “yeehaw” duds. Happily, we found this recently opened Western boutique that has a curated array of boots by Lucchese, Old Gringo, and Corral. Embrace your urban cowgirl with a Tasha Polizzi embroidered shirt or Patricia Wolf fringed wrap belt. For your dude back on the ranch, try a classic Western shirt in double dye silk twill by Ryan Michael.